Too. Many. Wireless. Speakers. Still, among the best products to come out in the past two years is unquestionably the Jawbone Jambox, a portable Bluetooth speaker with great sound and telephony too. Now it goes to eleven. Meet Big Jambox. Big Jambox is Jawbone's follow up to its smash hit Jambox. The original Jambox could rock your office, sure. But it wasn't going to rock your party. Big Jambox, on the other hand, will get the kids on the dance floor, shaking their asses, raising the roof, doing the Dougie, scrunching their Skrillex. Holla. Hella. Whatever. I'm not up on contemporary slang. What I do know is that this is a true home audio device. It will fill large spaces with expansive rich sound. And yet, like its predecessor it remains highly portable. At a mere 2.7 pounds and 10 x 3.1 x 3.6-inches, it fits easily into a messenger bag and has a great battery that lasts approximately forever. (Jawbone claims 15 hours). And thanks to Bluetooth connectivity, not only will it play your tunes through the air without cabling up to your laptop or phone, but it also doubles as a powerful speakerphone. Hit a button on the side, Big Jambox fires up its Bluetooth power crystals to nearly instantly connect with your music player. Using an iPod or cassette deck like some sort of last century troglodyte? No problem. It has a 3.5 mm audio jack as well. Buttons on the top control the volume, and well as play and pause, plus speakerphone. If you are using it with a phone, it will automatically pause the music when a call comes in, and resume where it left off when you quit your yacking. What more is there to say here about using it? It is a speaker that plays music or TV shows or the audio from the games on your iPad, and it also makes calls. It plays music. Through the air! Easily! Amazing! An aside: Quite frankly, I often think we should reformat our reviews. I mean, "using it" is such an artificial little vertical in the story. And boring, besides. What if we called it "in action?" That would still be somewhat artificial, but at least it sounds better. And don't even get me started on "no like." Also, my old friend Ken Kurson once told me that people who use the phrase "quite frankly" are assholes. Because, what, it's like otherwise I'm going to lie to you? Quite frankly, I think Ken is wrong on this. It comes in three colors, red, white, and black. Oh man, this thing sounds great. And it is quite loud. Uncomfortably so, even, in a small space. But better than volume is sound quality. Even maxed out, bass sounded smooth and not at all overblown, midranges came through nicely, and high notes sounded like MJ's ghost his own self. And then there's the spatial quality. Big Jambox's LiveAudio simulates 3D audio by basically using a cross talk filter to cancel out competing audio from the left and right channels, creating the illusion of spatial sound. It works pretty well. Close your eyes, and you hear the illusion of sound cascading around the room. Despite all that big sound, it really is portable. It won't weigh you down, palms easily, and fits into even mid-size over the shoulder bags with room to spare. But the best improvement Jawbone made over the original Jambox is a series of buttons on top that let you play, pause and skip tracks. Along with the volume controls, this makes Big Jambox a real contender as a home audio device. Yes, it makes it easier to control playback but also when you are really FEELING it, you want to mash something, you know? Also, it is harder to operate software buttons when you are drunk or high. And let's be straight: That's when loud music is at its best. Pairing is also well done—you just hit a button on the side with no code to enter. It supports two devices simultaneously—so you and a pal can take turns DJ'ing. .
Oh. It's also a type one speakerphone—which basically means it is certified as an office speakerphone. The mic works great both across a table and up close. I screamed obscenities into it, making vague but horrible threats, hollering in my best Steve Jobs berating a powerless underling voice, trying to blow out the audio and with it the fragile little egos on the other end of the line, yet everyone heard me loud and clear. Sadly. What the butts, Jawbone? All that space and you still couldn't fit a WiFi antenna in there? Given that you can program this box via web-based software and conceivably enter a password there, WiFi would be a killer feature for in home use. Not only would it open up the possibility of using it as an AirPlay speaker, but it also would have made for a more robust connection with a longer range. Because my biggest, and basically only substantive, complaint is that when you use it in wireless Bluetooth mode, the connection drops on occasion. It didn't happen often, but it dropped just enough that it made me feel anxious. Finally, the name. Radio Raheem had a big jambox. Lloyd Dobler had a big jambox. This is not that big. I'm okay with Bigger Jambox, or even Kind-of-Big jambox. But I can't bring myself to call this thing (that would be admittedly extremely uncomfortable and possibly dangerously loud if carried on the shoulder) "Big Jambox." So, I just call it my "B.J. Box," a name I think we can all work with. Fantastic design. Great sound. Easy set up. No brainer: It's a great buy, even at $299. It is probably even a better bargain than its smaller predecessor. 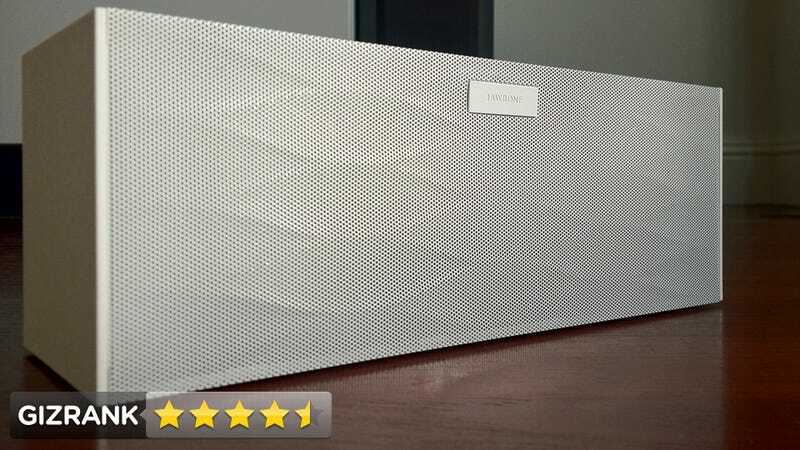 Before you buy, you should also take a look at Sony's tragically named SA-NS500 Portable Wi-Fi Speaker, which boasts better sound plus Airplay. But it's also far less portable—it's bigger and heavier and harder to set up—and it costs an extra $100. Given that the entire point of wireless speakers is portability (after all if it wasn't, just run some cable) that's an important feature. And for now at least, given the price, size, sound and ease of setup, the Big Jambox is the king of portable pop.